Bar Hill is a village lying only approximately four miles north west of the University of Cambridge, and is surrounded by countryside. Good local facilities are available in the centre including a range of shops with a Tesco Superstore, 18 hole golf course, junior and infants school, and regular bus service to both Cambridge and St Ives. The village is reached via the A14 which directly links with the Cambridge northern by-pass and M11 motorway. The property stands well back from the road in an elevated poisition constructed of brick faced walling beneath a pitched tiled roof. In recent years the accommodation has been further improved with double glazing, extensive laminate flooring, small conservatory to the rear and refitted kitchen and we recommend a detailed inspection. 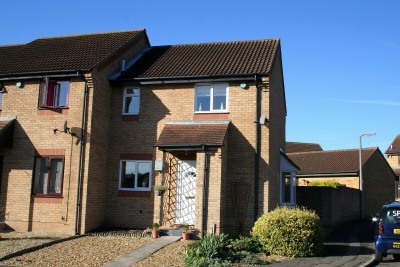 Our full range of properties, many which include internal and external photographs, is available on our dedicated website - www.tylers.net - which is updated daily. We are able to offer Independent Mortgage Advice via Berkeley Private Finance Ltd. RECEPTION HALL understair cupboard, laminate flooring, radiator, stairs off to first floor. KITCHEN BREAKFAST ROOM about 10'6 x 7'6 (3.20m x 2.29m) an excellent array of fitted high and low level units, round edged work surfaces with cupboards and drawers below, single drainer stainless steel sink unit with mixer tap, built in Beko oven and four ring gas hob with extractor over, breakfast bar, wall mounted gas fired boiler serving central heating and domestic hot water, double glazing, tiling to splashbacks, radiator. DINING ROOM about 8'2 x 7'5 (2.49m x 2.26m) laminate flooring, double glazing, radiator. CONSERVATORY about 8'2 x 6'4 (2.49m x 1.93m) double glazing. LANDING built in shelved airing cupboard housing hot water cylinder, double glazing. BEDROOM 1 about 10'5 x 9'10 (3.18m x 3.00m) built in wardrobe cupboard, radiator. BEDROOM 2 about 12'9 x 6'7 (3.89m x 2.01m) double glazing, fitted wardrobe cupboard and store cupboard, radiator. BATHROOM white suite comprising panelled bath with shower and screen, low level WC, pedestal hand wash basin, laminate flooring, double glazing, radiator. Attractive landscaped front garden with flower and shrub borders and path to storm porch. Enclosed rear garden laid to lawn with flower and shrub borders, patio and decked area, path to GARAGE with loft and personal door. COUNCIL TAX BAND B (£958.88 for 2006/2007).